Sometimes, you need a good was or had to keep things coherent and easy to read. A little Strunk and White is a dangerous thing. Some editors [or writers] are driven by a cursory reading of The Elements of Style to change such sentences as “the outcry was heard round the world” to “everyone in the world heard the outcry.” True, the active voice is generally more forceful, and a procession of passive constructions is a safe cure for insomnia. But the passive voice is a perfectly legitimate alternative when used for variety or to emphasize a key word in the sentence by making it the subject (e.g., “outcry” in the example above). The habitual use of active voice, however, makes for forcible writing. This is true not only in narrative concerned principally with action but in writing of any kind. Many a tame sentence of description or exposition can be made lively and emphatic by substituting a transitive in the active voice for some perfunctory expression as there is or could be heard. Note . . . that when a sentence is made stronger, it usually becomes shorter. Thus, brevity is a by-product of vigor. . . . . The sharks were circling. . . . . Bobby Patterson had been at the party a total of three minutes. But half that time was all it took for the smell of fresh blood to circulate amongst the single women. I have to confess, before I was published, I most likely would have suggested the author of three such sentences, as the opening lines no less, revise them so that she wasn’t starting her manuscript off with three passive-verb sentences—in all seriousness and with the best of intentions. But, you see, I was one of those brainwashed unpublished writers who believed in “the rules.” I believed that everything said at every writers conference should be taken as gospel, written-in-stone rules; and as long as I followed the rules, I would get published. Yes, an over-reliance/overuse of was and had is a sign of lazy writing—because it means you haven’t gone back to see if you can revise those sentences using stronger, more active, more descriptive language. . . . . The sharks circled. . . . . Bobby Patterson entered the party three minutes ago. But the smell of fresh blood circulated amongst the single women in half that time. Doesn’t flow quite as well, does it? To address the use of had . . . The past perfect tense is used for an action already completed by the time of another past action (Jane hailed a cab after she had walked several blocks in the rain) or for an action already completed at some specific past time (By 8:30, Jane had walked two miles). It had taken Zarah a couple of years to say anything to Kiki about how much it bothered her to have someone make a fuss over her whenever she was sick. Have you ever read something which confused you about what was happening now and what had happened in the past in the story’s timeline? It’s probably because the author was too scared to use had to indicate a previous event in the timeline. So how many wases and hads are okay? Do the same with wasn’t, were, weren’t, had, and hadn’t. What you see in my example above is pushing it for how many someone can get away with . . . and I can get away with it a little more because I’m already multi-published (neener, neener, neener)—of course, if I’d had time to actually go back and revise Love Remains before I turned it in, I would have done this exercise and eliminated some of the wases and a lot of the hads. The boom of Patrick’s voice reverberated through the house, though Zarah could not make out what he was saying. The boom of Patrick’s voice reverberated through the house, though Zarah could not make out his words. Sometimes, with had it isn’t past present, it is actually indicating possession (She had a green purse) or necessity (She had to go to the grocery store). In those cases, see what other words you can substitute for those that mean the same thing (She carried a green purse or She needed to go to the grocery store). What has your experience with this rule been? Do you ever get distracted by seeing was or had when you’re reading? Do you ever noticed convoluted sentences that pull you out of the story that could have been fixed by a good was or had? I’ve read books where it seems too forceful and just doesn’t flow well. And…neener, neener, neener…it just doesn’t seem fair that multi-published authors can get away with so much. Some of the stuff I read from the best seller’s list is just crazy with head hopping, passive verbs, and just plain nonsense. I guess it’s all about the money. I was embarrassed when I did a search for had in Love Remains last night and discovered how much I overused that word. I hope I will never become one of those authors who refuses to be edited or who refuses to improve her craft simply because I’m a published author and therefore publishers will let me get away with it. I definitely want to be a “practice what I preach” kind of writer! I just have to figure out how to give myself more time to go back and do that kind of revising. Well, I personally think that some rules shouldn’t be so strict. If it sounds good and flows, then what’s the bid deal. The whole thing about -ly words…well, I rather like them. Sometimes they say exactly what I need to say. I know anything overdone is a problem, but everything in moderation, right? We’ll talk about adverbs next week! Okay, I’m ready to hear about those adverbs! Hit us with your best adverb shot. Don’t forget “just” and “really.” It was amazing how much better mine sounded without them. They’re right up there with “-ly” words, to me. Oh my! I don’t even want to begin to think of all the ‘was’s and ‘had’s I have in my novel! Kaye, great post!!!! I have scotched taped this huge note right in front of my face. On it I wrote the most important dos and donts, and one of them says NO WAS HAD. As you know, there are plenty more “rules” a writer needs to follow *sigh*. Sherrinda, you are right. Make sure you become famous and then, just then, allow yourself all the mistakes you can make. Wouldn’t that be nice? An editor friend said to me at a conference a few years ago, “Sometimes, I miss seeing a good was.” She’d been inundated with first pages at that conference where the writers had gone around their elbow to get to the itch on their nose just to keep from using was in their writing. It’s a perfectly legitimate word. But just like everything else, should be used in moderation. Well, I am a reader….not a writer, but I think you gave some good advice here, Kaye! I enjoyed the post!! THANK YOU. I am not a writer, but I am a critical reader and have been exposed to most of the major “rules” through a mutual friend who went to school with you at SHU. This is a major pet peeve of mine – incredibly clunky writing due to the elimination of every single instance of “was” and “had” in a manuscript. When I read stuff like this I want to call up the author and tell them that those words exist for a reason – and they really are necessary in some instances! I’m surprised editors don’t fix some of it, but then I guess I’m not all that clear on exactly what kind of editing editors actually do. It depends on the publishing house, but some houses have cut back their editorial staff so much that an author is lucky if her manuscript goes through one round of copy edits—much less quantitative/content edits. And most publishers have done away with line edits completely. One of the many “sweeps” through my manuscript was in trying to eliminate those pesky words. But do you know, I found, finally, that ANY word used too much is clunky, and I actually ended up leaving some in. This is one of those dangers of the revision process. Trying to apply all the “rules” and losing sight of voice and flow and style. Not that overusing was or had is a viable style choice either, but you know what I mean. As a reader, I haven’t really thought about how often those words are used to be honest. I think it could be distracting to the story if it is used repetitively on the same page. Something like that would catch my attention. It’s all about the flow. All active verbs and no was/had can be tiring to the reader. Great myth to take on, Kaye. I’ve had to adjust to this one, finding somewhere in the middle of the pendulum that swung from one far end when I knew nothing about the preference for active verbs and deep POV, and the other the end, when I thought I knew. Still learning. This is one of those “rules” that, when brought to our attention, we tend to notice much more often. I’ve always said that if J.K. Rowling had eliminated 60% of her was + –ing verb combinations in favor of more active verbs (and gotten rid of her embellished dialogue tags), her books would have been MUCH shorter! The word is out. 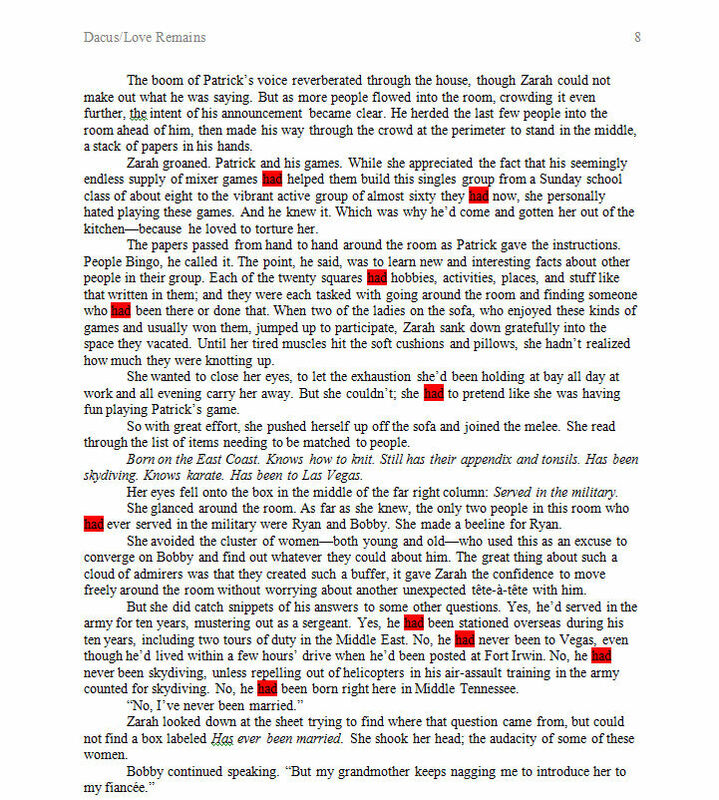 Most adverbs are unnecessary, and they tend to clutter sentences and annoy the reader. We don’t want to do it. 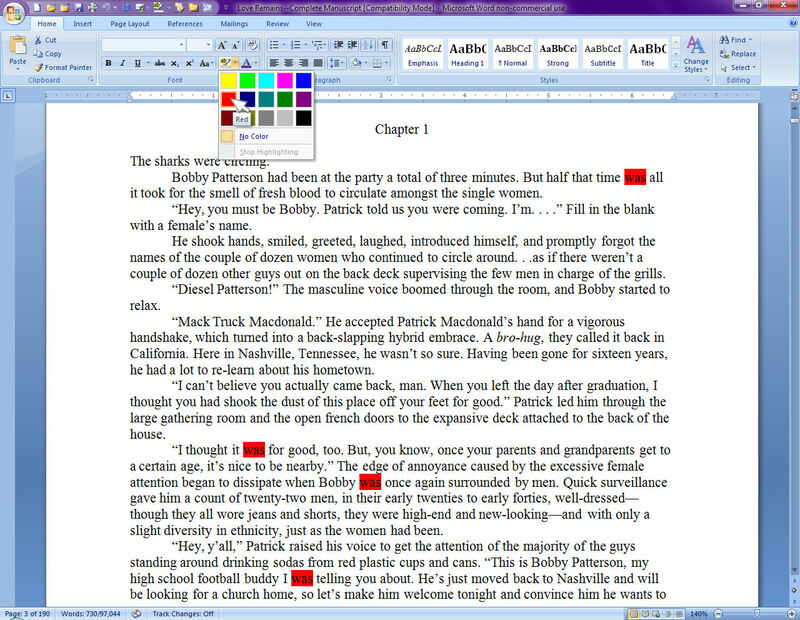 So back to editing, using my writerly (ooppps) skills in plucking out the pesky stuff. Yep, that’s next week’s post! Ok, I need to print this post and study it before I comment. 🙂 One thing I do know for sure is, FIND is my friend. 🙂 Thanks for a great post! Jill, the basic tenet to take away here is: everything in moderation. This isn’t about the words was and had, but I wanted to bring this up. I have read soooo many books lately (seen films too) where they use the word me when they should use I. Has that changed in grammar and I am not aware? That’s when I wonder where the editor is. No, Sylvia, it hasn’t officially changed. This is a relief as well as a dreaded message… It means I have a lot of editing to do on my own works of art 😉 and also that was and had are okay at times. But I still have a lot of editing to do… Great post, Kaye! thanks! Yes, now that I know the rules, I am distracted by them in my reading. I recently finished Tom Clancy’s new book, DEAD OR ALIVE, and found one ‘had had’ sentence. How does that happen? It almost made me want to put the book down. Terrific post! Thank you! Very enlightening!